Watchdog Music Publishers - You Need It, We Write It: Welcome! Use these Quick Links to find exactly what you are looking for in our Music Catalog! We have music written in skill levels for everyone! If you can't find what you need please contact us. Another great solo by Jeff Kressler for French horn. 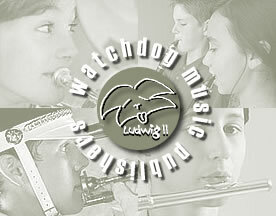 Welcome to the new Watchdog Music website! Barbara has a Masters in Music Education from the University of Illinois. She taught band, 4th thru 9th in Saginaw, Michigan for 25 years before retiring in 1991. Ms. Bruske is an active adjudicator, performer, and composer. She is a member of SASSE saxophone quartet and the Saginaw Eddy Band, and performs on keyboard for various social functions. After retiring she formed Watchdog Music because of the need for more varied and superior quality solo/ensemble music for the junior high/middle school age group.